In an unexpected move, the infamous anti-piracy technology Denuvo has been removed from the PC version of Doom. The development follows a similar move last month when developer Playdead removed Denuvo from its game 'Inside'. Did a refund clause in the Denuvo deal trigger these removals? With piracy now an accepted part of video game culture, the main aim of developers is to stop their games leaking in the early days, weeks and months following their launch. It’s suggested that this piracy-free window of opportunity might allow the bigger and more ambitious titles to recoup much of the money spent creating them. No surprise then that companies are offering solutions to achieve that aim. The main technology facilitating this breathing space today is Denuvo. This anti-tamper technology sits on top of other DRM, making the majority of games completely uncrackable. However, in more recent months, Denuvo protection has come under fire from a group calling itself CPY. As a result, more and more Denuvo-protected games are appearing free-to-play online, having had their protections circumvented. But as pirates celebrate, something unexpected is happening. Having been cracked by CPY, some games are having Denuvo removed by their developers. The latest case involves first-person shooter, Doom. As one of 2016’s biggest AAA releases, Doom is a highly desirable title so it was no surprise it was protected by Denuvo following its release in May. 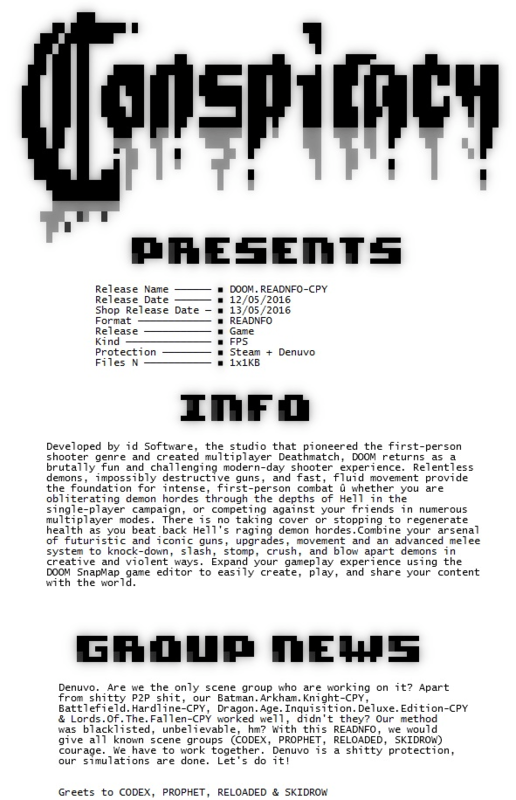 However, the game was cracked relatively quickly by CPY and began appearing on piracy networks early September. Now developer Bethesda has removed Denuvo from the game altogether. If one looks at the situation logically, it makes some sense that after Denuvo has served its main purpose, it’s technically no longer needed and can be removed. However, after paying out for Denuvo protection (which is rumored to cost upwards of hundreds of thousands of dollars per game), why would developers like Bethesda just not leave it intact? For some time there have been theories that some kind of refund might be available to developers if Denuvo protection fails to live up to its billing. Some meat has now been put on the bones of that suggestion by a Reddit user who claims to be a games developer at a company using Denuvo. “Game dev here, I work for a large studio that started using Denuvo recently. I’m neutral on piracy and pirate TV shows a lot, so don’t give me a hard time, certainly not here to judge,” he wrote in a post a few hours ago. In the case of Doom, Denuvo was cracked by CPY four months after release but since it’s one of the bigger titles, it’s conceivable that a longer period could still be eligible for some kind of refund. Ultimately, Denuvo claims that its protection pays for itself so when a game appears online too soon, it may not have reached its goals. “One of the reasons why the management of my company used it, they think it is a no lose situation. I personally think it is more nuanced,” the developer explains. “Denuvo is expensive and my management think we lose a fortune to piracy because the industry inflates the figures as I think most of you all know. My management buy in to the inflated figures and Denuvo Software Solutions of course uses them also. “Obviously I’m just a developer so not aware of the numbers but eventually I’ll find out if Denuvo helped, my educated guess is that it won’t help improve sales figures as much as the management hope. To protect a AAA game, Denuvo charge high 7 figure sums,” he concludes. Last month, Denuvo was also removed from the adventure game ‘Inside’. That title was released in July but was cracked by CPY in just six weeks, the fastest Denuvo defeat on record. With two titles setting the trend and another on the horizon, we shouldn’t have to wait long to see if a pattern emerges. Deus Ex: Mankind Divided was released in August and exactly three months later it was cracked by CPY. If the pattern follows, Denuvo should disappear from that title in a couple of months. How all of this will affect Denuvo’s sales remains to be seen since the company’s protection, while still formidable, is not the titan it once was. It does, however, still cover those crucial early months pretty well and that’s probably acceptable to most of those involved.